Pull ups! We all want to be able to knock out them out like a marine. In the eyes of many, it’s the ultimate show of strength – especially when you don’t have a barbell handy! But getting that first pull up seems incredibly hard. Most people just jump on a pull up bar and try to pull themselves up. Which is ok for a start – but think about it, was that the way you learned to squat and deadlift? Did you just grab a bar and have a go? Or did you also think about engaging the right muscles and doing supplementary exercises, such as lunges and goblet squats, to increase strength for those movements? Hopefully you did the latter, especially if you work with a trainer. Well, the same applies to pull ups. Rather than just jumping on a bar and having a go, we need to think about what muscles need to be engaged and which muscles need to be strengthened in order for you to have better pull ups. And getting your chin above the bar is really really hard! There’s a reason why pull ups feel like this, and it’s because of two very important muscles: the lats and the lower traps. Now, there are many muscles involved in a full pull up. The pull up is a compound exercise involving muscles of the forearm, upper arm, upper back and core. However, it’s the engagement and strength of the lower traps and lats that really determine how successful your pull up will be. Most people do not engage their lats or lower traps properly when doing pull ups. Did you know that the lats, or latissimus dorsi, are one of the biggest muscles in the body? So we probably want to make maximum use of them when we do our pull ups. The lats are heavily involved in the downward rotation of the scapula (shoulder blades) when doing a pull up. They are also very strong at pulling the arm towards the trunk. This are precisely the movements we need to get strong at in order to do pull ups. When the arms are at full extension overhead, this is actually a relatively weak position for the lats to be in. This is one reason why it’s so hard to get started in a pull up. As the arms get closer to the sides of the body, the lats can pull more strongly – so they really come into their own in the second half of the movement. When most people think of the traps, they think of the upper traps (red fibres in the picture on the right). These are the bulging muscles on top of the shoulders, which are developed from shrugging motions. Olympic lifters end up with big traps because of the shrug at the top of the pull. 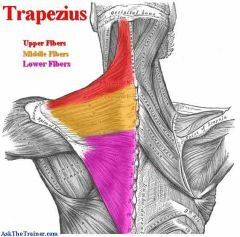 But we’re not interested in those in the pull up, we want to develop the lower traps (purple fibres in the picture). 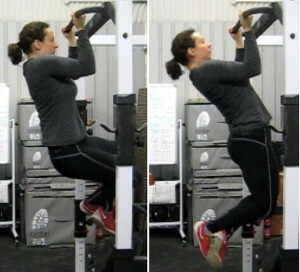 In most people the lower traps are somewhat under-developed and weak, but they are important for a properly engaged pull up, especially at the start of the movement. The lower traps are heavily involved in scapula retraction and depression. They pull the shoulder blades back and down. This movement needs to occur at the start of the pull up, and be maintained throughout, in order to execute a perfect pull up. Why is scapula position important? Do you think about the position of your shouder blades when you’re trying to do a pull up? A strong and stable pull up is one where the shoulder blades are held down, giving the strong back muscles ‘room’ to work. In the picture on the left, my shoulders are hunched up because I’m trying to use the muscles on the front of my shoulders and my arms to complete the pull up. In the picture on the right – at exactly the same point in the pull – my shoulders are down and back, and my back is at more of an angle, allowing the back muscles to work more effectively. The lats are stronger at this more horizontal angle. One of my favourite cues for the finish of the pull ups is to exhort people to ‘pull your elbows into your sides‘, as it really helps the lats and lower traps to engage. One reason why it’s so difficult to get your chin over the bar at the end of a pull up is that your shoulder blades are coming up too high and you get all ‘hunched’ near the top of the pull up. Your lower traps have ‘let go’ of the shoulder blades and that strong back angle has gone. You need to keep holding the shoulder blades back and down in order to finish the pull up strongly. And for that, you need strong lower traps and lats. Since we’re training for strength, I prefer lower reps (5 reps or fewer) but higher resistance. The rule of thumb is, use as much weight/resistance as you can while maintaining good form. The scap pull up is a brilliant exercise to improve your pull up position and ultimately your ability to do excellent deadhang pull ups. Here we’re working on the start position of the pull up, getting that initial engagement of the lower traps in particular, to initiate the pull. Start in a deadhang with an overhand grip (more lower trap engagement). Pull your shoulder blades back and down without bending your arms. Your chest should rise up as your shoulder blades retract and depress. All the movement should come from the middle of your back. It’s a bit like a shrug in the opposite direction – a shrug for the lower traps, if you like. Notice that at the start, my shoulders are already pulled down, so there’s already a bit of muscle tension holding the shoulder blades down. If there wasn’t and I was completely relaxed at the start, my shoulders would be right up by my ears. When doing multiple deadhang pull ups, you always want to keep a bit of tension in the back, even in the bottom position. Aim for 3-4 sets of 10, if your grip allows. If you struggle to hold your bodyweight for that long, work on your deadhang strength first before progressing to this drill. When you can deadhang for 30 seconds or more, try this drill again. Now we’re working on the top part of the movement – that elusive chin-over-bar position. Whereas the start of the pull up is initiated mainly by the lower traps and pecs, the pull up is completed mainly by the lats and biceps. Use heavy lat pulldowns and pause in the bottom position for 3-5 seconds to build strength. Aim for 5 sets of 5 reps.
As with a pull up, make sure that your shoulder blades are always pulled back and down. If your shoulders are up by your ears during the pause, reduce the weight on the bar until you can hold it in the correct position. You can progress from lat pulldowns to band pull ups with a pause at the top. This is quite challenging since the band gives you the least resistance at the top of the movement. Pause for 3-5 seconds at the top of the movement and aim for 5 sets of 5. Start at the top of the pull up and slowly lower yourself down, all the time keeping the shoulder blades back and down. That way you know that you are strengthening the lats and lower traps and all the assistance muscles doing this exercise. Lower for 10 seconds and aim for 5 sets of 5. Remember, we’re trying to engage the back muscles, particularly the lower traps and the lats, not pull as much weight as possible any old how. If you are not used to working these muscles, they may well feel weak at first. You may find that you can’t pull as hard as you could before. However, in order to make progress beyond where you are right now, you may need to take a step back and re-train your body to pull more effectively. Very very very informative article! I am challenging myself with that, and it was very good to me. Very glad it was helpful. Good luck!